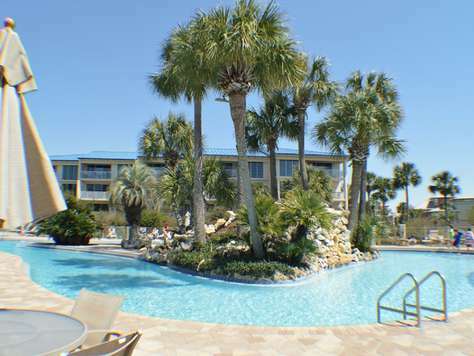 Eastern Shores 213 is a nicely decorated condominium directly on the Gulf of Mexico. You can enjoy the beautiful sunrises and sunsets on the spacious balcony. You will love the roomy living area with the vaulted ceiling and stunning views of the emerald green waters. The open floor plan of the living area makes it easy to relax together after a long day at the beach. You have all the modern conveniences of home in the fully equipped kitchen and ample seating at the breakfast bar and dining area for 8. Relax in the comfortable living room enjoying the sea breeze and listening to the gentle waves of the Gulf of Mexico as it lulls you to sleep after a long day at the beach. Eastern Shores 213 is on the 3rd floor of a 3 story non-elevator building. The first level has a king bedroom, full bath, with living room and kitchen. The second level (loft area) has a king bed, full bathroom, and two twin beds seperated by a partion. Each bedroom has a flat screen television. The 32 inch television in the twin bed area, in the loft, has easy access to connect any game systems that you might bring with you. Due to limited parking, there is only ONE vehicle allowed to be parked in the Eastern Shores parking lot; parking passes are required. Eastern Shores is on the Western side of Eastern Lake in Seagrove Beach making it a quick bike ride from many restaurants. It is 2.8 miles away from Seaside and 6.1 miles from Rosemary Beach. Pier Park is only a 25 minute drive and the Silver Sands Outlets in Sandestin are only 18 miles away. 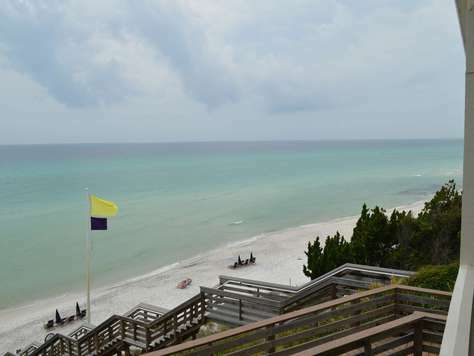 There is plenty to do along Scenic highway 30A. You can rent bikes and ride to Seaside. You can rent paddleboards and kayaks and spend the day enjoy the beautiful green waters of the Gulf or explore the ecosystem of our unique dune lakes. 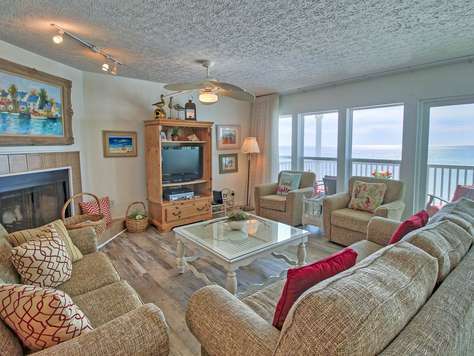 This rental includes 2 beach chairs and umbrella every day of your stay from March-mid October; weather permitting. 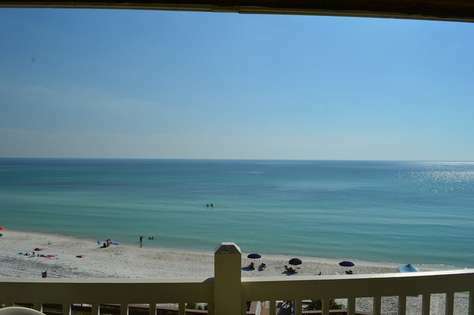 Located on Scenic Highway 30A , this top floor, Gulf front condo offers unbelievable views of the emerald green waters and sugar white sands of the Gulf of Mexico. The King master bedroom has a wall of windows so you can wake up to the relaxing sight of the Gulf. Sleeps eight easily with a king in the master, two queens in the second bedroom, and sofa bed in the living room of this spacious unit. Easy access to beach or pool from elevator. Right outside of Rosemary Beach in Seacrest, High Pointe is the resort that has it all. This gated Gulf front property offers amazing views of the emerald green water and sugar white sands as well as a 6,500 sq ft lagoon pool with waterfalls, a kiddie pool, heated outdoor jacuzzi, playground, lighted tennis courts, and a shuffleboard court. High Pointe even has its very own beachfront restaurant, Crabby Steve's! Starting Memorial Day weekend and lasting through the first week of August -New for this year there will be a golf practice cage, on site babysitting service, beach bonfires every Wednesday, and an onsite tennis pro available for lessons. Crabby Steve's will also provide food and beverage service by the pool. Expanded watersports (paddleboards, surfboards, small sailing craft, etc.) and watersports lessons on the beach will also be available. 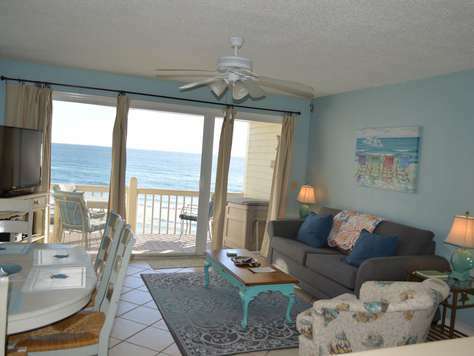 Condo 42W is a 2 bedroom, 2 bath, 1300 square foot Gulf front unit. This condo has had upgrades to the master bathroom with double vanities, tiled shower, soaking tub, and a chaise lounger in the master bedroom. The dining table and bar stools are recent additions too. 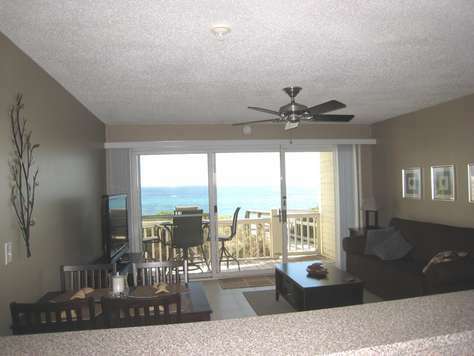 There are magnificent views from the balcony, 3 Flat Screen TV’s, DVD/VCR, stereo, and seasonal Beach Service! Perfect location in Seacrest, along Scenic 30A, this direct gulf front, first floor condo, with gated balcony off living room, has outside dining table and 4 chairs, a basket for beach toys, so the sand stays outside, and wonderful views of the emerald waters of the Gulf of Mexico. Everyone is welcome of course! but, the responsible party booking this reservation must be 25 years of age or older and remain present throughout the entire stay. Inside this one bedroom, one bath escape, perfect for a couple, there is a Queen bed in the bedroom, flat screen TV on the dresser and drapery covers the closet. A spa feel bathroom, with glass counter tops double vessel lavatories, accented by a teardrop crystal bar chandelier. All tile shower surrounding the tub, has double shower curtain rods, with a rainfall shower head. There is a small stack washer & dryer in the hallway alcove, along with ironing board and iron, as well as a great storage space for your luggage. This open concept kitchen, dining and living room, has seating at the industrial look dining table with 4 chairs, additional seating at the kitchen breakfast bar for snacks, or conversations while cooking. Soft close cabinets, under cabinet touch lighting and quartz counter tops, maintain the elegance of the European type appliances; two door refrigerator with freezer on the bottom, smooth surface stove, built in microwave, which are all Stainless, and several counter top small appliances, like coffee maker, blender, can opener, toaster and more. This condo has a fully furnished kitchen with dishes, cookware and utensils. A flat screen TV on the wall of the living room area, can be seen from the kitchen or the full size sofa, which is also a sleeper. The over-sized chair, which makes out to a twin size sleeper, allows you to catch up on your favorite shows or big game, while relaxing in the comforts of the living space. Wi-Fi is included in this condo as well as seasonal beach service, 2 chairs and 1 umbrella, each day of your stay, from March to October; weather permitting.. This remodeled first floor 1BR\1BA +2 Bunks features direct, private access from back porch to beach. Means no lugging your beach gear around the building and up flights of stairs. It is equipped with high speed wireless \ WiFi internet and 2 flat screen TVs with digital cable and DVD players. Conveniently located between Rosemary Beach and Seaside, so close to great restaurants and shopping. Lots of local activities including biking/jogging/walking trail right outside complex, stretching along scenic 30-A. 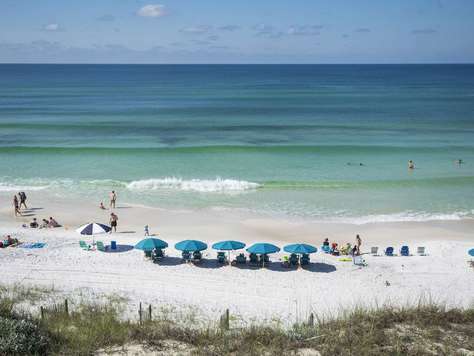 Enjoy the award winning Beaches of South Walton with unspoiled powder soft sandy beaches and emerald waters – no high rises here! Enjoy your meals and sunsets on the spacious outdoor seating area with 4 swivel bar height seats and table to take in the fantastic views. Located on scenic Hwy 30A, Mistral 11 is a one bedroom plus bunks and queen sofa sleeper, one bath condominium in Seacrest Beach. It sleeps six and is perfect for your couple’s getaway or family vacation. Wake up to bright sunshine and crashing waves and enjoy your morning coffee on the balcony directly overlooking the sugar white sands of the Emerald Coast. Enjoy the miles of biking/walking/running paths that run from Seaside to Rosemary beach. In this small community, the views are absolutely breath taking. Everyone is welcome of course! but, the responsible party booking this reservation must be 25 years of age or older and remain present throughout the entire stay This unit features a bedroom with a queen size bed, built-in hallway bunks, a comfortable queen size sofa bed and a full bath with washer and dryer, a fully equipped kitchen, living and dining areas and Gulf-front balcony. Mistral Condominiums location is convenient to Rosemary Beach, Seagrove, Watercolor and Seaside boutiques and restaurants; while being in a less crowded, family friendly area. 2018 Renovations throughout, with no carpet. All three bedrooms have flat screen TV, with a 60" flat screen wall mount in the living room. Located in the quiet area of Eastern Lake in Seagrove Beach, Sugar Dunes is ideal for your vacation. 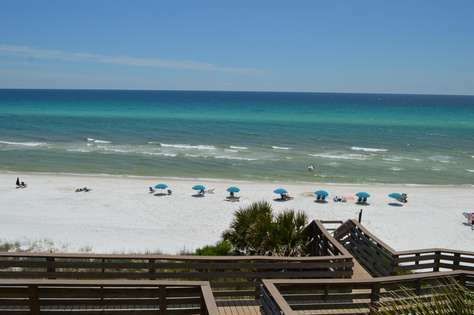 This Gulf front gated condominium complex offers amazing views. Only space for one vehicle in this gated property for this condo. Additional vehicles may be parked at the Emerald Waters Realty office. 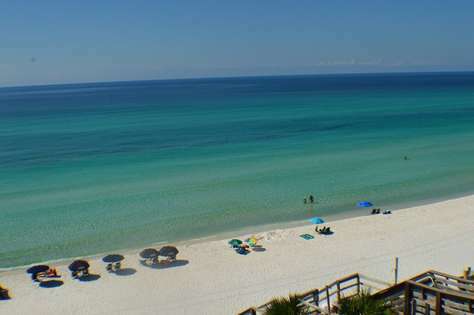 Only 4 miles away from Seaside and 6 from Rosemary Beach you are close to everything on 30A. Pier Park in Panama City Beach with a movie theater, amusement park, restaurants, and a fishing pier is only 20 minutes away. BeachyCations Rentals is your premier vacation rental service company serving the Panama City Beach community and surrounding areas. Call us at (850) 588-4391 to have your rentals showcased on that Beachy pedestal! Serenity, my ideal place to stay.